Major department: issues major check notifying Graduation Evaluations (Registrar) of your major requirements. 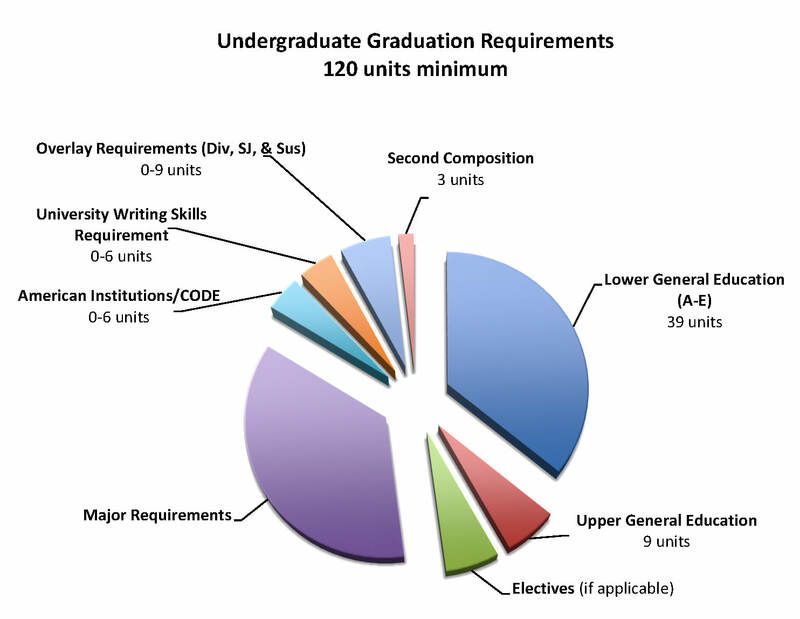 GE/Academic Advisement Centers: advising centers, such as AACE, will review the non-major requirements such as General Education (GE), University Writing Skills Requirement (UWSR), and unit totals. Students must proactively visit an advising center for review of these requirements. 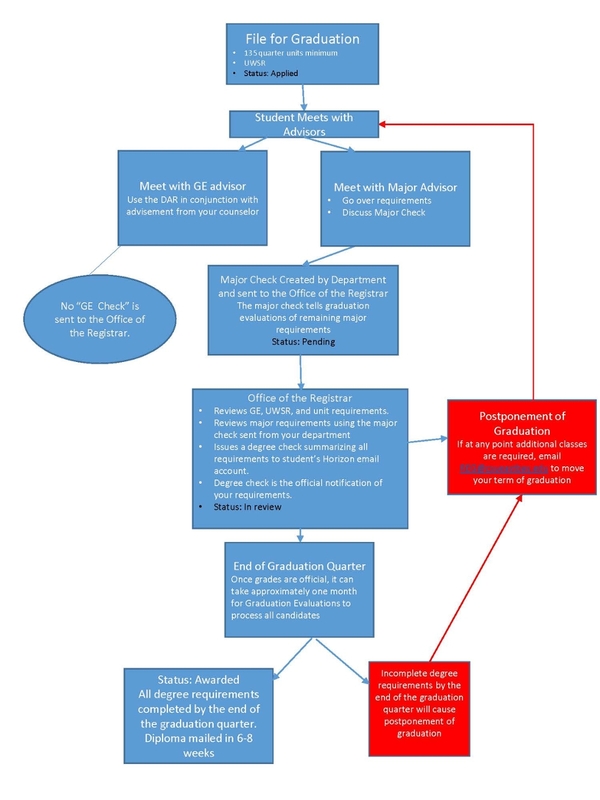 Graduation Evaluations (Office of the Registrar): responsible for the verification of all requirements necessary for graduation and the eventual conferral of the degree. Participation in commencement ceremonies does not imply degree conferral. No diplomas are granted during commencement. Commencement refers to the ceremony, officiated by the President of the University, where you celebrate and share the excitement and importance of your academic accomplishments with peers, family, and friends. Cal State East Bay has only one commencement ceremony per year which is held in June. You will not receive a diploma at the commencement ceremony. Confirmation of degree completion will not occur until official grades are posted. Graduation indicates that degree requirements have been completed and your degree has been awarded and is recorded on your official transcript. If you meet all graduation requirements, two to three months after the graduation filing quarter of candidacy ends, your degree will be posted to your academic record in MyCSUEB. Check your Horizon email account regularly as you will be notified of any issue with your graduation via email only. It can take up to two months after the quarter ends for your degree to be awarded and displayed in MyCSUEB. Check your Horizon email account regularly as you will be notified of any delay in graduation. Once your degree is awarded in MyCSUEB, it will take an additional six to eight weeks for your diploma to be mailed to your permanent address; your legal name as it appears on your official academic record and transcript will be printed on your diploma. In person pickup of diplomas is not permitted. Cal State East Bay offers Graduation and Commencement Workshops beginning approximately 3 months prior to the annual commencement ceremony in May. Attend a workshop to learn how to avoid delays in your graduation, what to expect when you are close to graduation, important commencement ceremony details, and more! Below is a list of Graduation and Commencement Workshops for Cal State East Bay's 2019 commencement. Mark your calendar! You may also view the Graduation and Commencement Workshop slideshow presentation online. Cal State East Bay recognizes undergraduate students at graduation for consistently high scholarship through their entire academic careers, which includes coursework they may have transferred in from other institutions. You must have completed at least 60 quarter units of coursework in residence (as defined in the university catalog) at Cal State East Bay. The GPA is officially calculated at the time you have completed your graduation requirements. Therefore, graduation with honors is governed by the catalog in effect at the time of your graduation. The honors designation will be noted on your diploma and official transcript. The conditions noted above apply equally to second-baccalaureate degree candidates. Post-baccalaureate and graduate students are not eligible for university honors. Academic GE Advising - Consult with an advisor regularly. Contact AACE , EOP, EXCEL, as appropriate. University Writing Skills Requirement (UWSR) - Attend a SCAA workshop to help you prepare and succeed on the Writing Skills Test (WST). Consult with a major advisor regularly and if applicable a minor advisor. Department contact information is available online. The Student Center for Academic Achievement (SCAA) has provided content tutoring for writing across the curriculum, all math and statistics courses, and selected science courses. Additionally, the SCAA offers academic support through new and innovative programs such as the Writing Associates, Supplemental Instruction (SI), and preparation for the Writing Skills Test (WST). The IAP serves as a roadmap to facilitate graduation requirements under your major, and if applicable, minor program(s). Degrees will be awarded to graduation candidates that have completed all degree requirements approximately two to three months after grades are official. A diploma will be mailed to your permanent/home address within six to eight weeks after the degree is posted to your academic record. 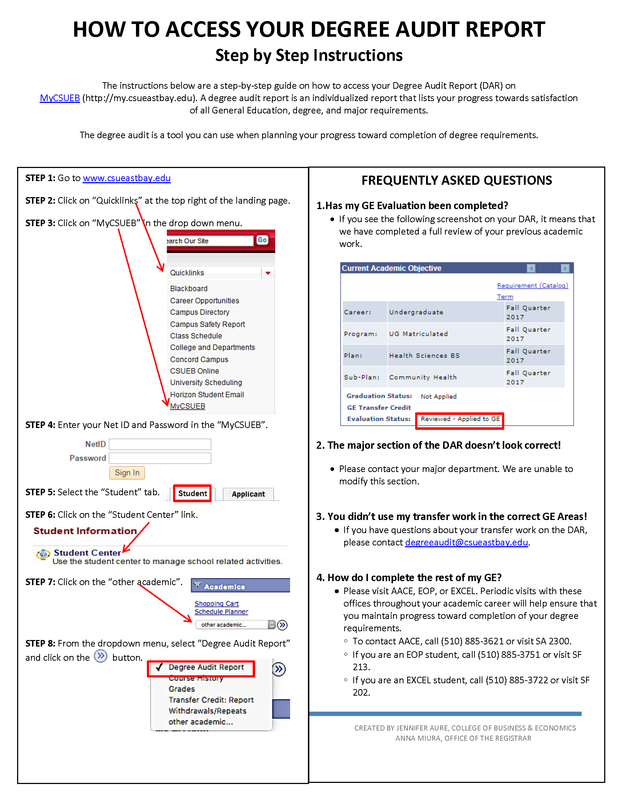 You can also review additional information regarding diplomas online.